I was on a mission. A mission for potatoes. Not just any potatoes, but the specially fried potato known as frites. You might think that they are the same as simple french fries…but don’t be fooled into thinking that. They are more than french fries, they are special. And in Belgium, they are king. 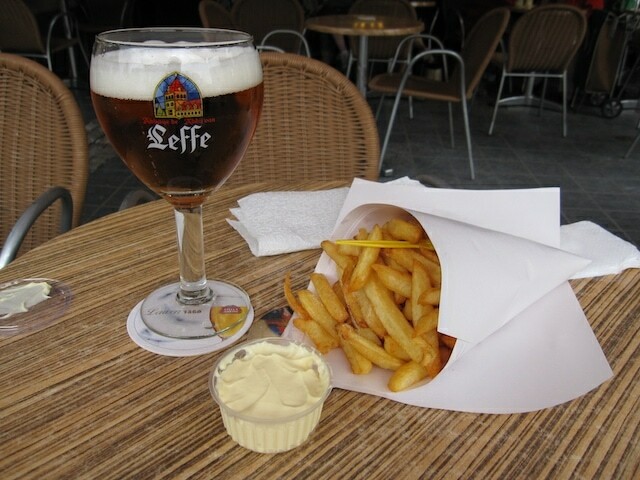 Belgians consume on average 75 kg (165 lbs) of fried potatoes per person each year, a third more than Americans. Chocolate Frites...the best of both worlds? So how do you find the ‘best’ out of those 5,000? Where do you start? If you go to the touristy part of Brussels, around the Grand Place, you’ll find plenty of friteries, but pass them all up. Yup, that’s right, walk right on by. Don’t waste your grease quotient for the day on the tourist joints. Instead you need to go where the locals go. I decided to do some research on this so I first started with the tourist office. I went inside and asked the woman for a map and where the best place to eat frites was. But before she could answer, I quickly corrected my question “Where do you go eat frites in Brussels?” She quickly circled a place on the map called Place Jourdan outside of the main city center and near the EU buildings. “You’ll find the best frites here.” She said. For a second opinion I looked at my Use It Brussels map (cool free map with tips from locals) and it had sarcastically listed 6 places as the ‘best frites’ in Brussels. So clearly there was some debate on this. However the Place Jourdan friterie was on their list. I also asked other locals where they ate their frites. My friend Alison (an expat blogger in Brussels) said that she used to eat them in Place Saint Josse, but recently the man there who ran the friterie retired from frite making. “Really? Retired from frites? !” I said thinking it weird that making frites was looked at as a profession to retire from as well as sad he had no one to pass on his friterie to. Alison now goes to Place Jourdan to Antoine.